Spending 10 days in Italy might not be enough but it’s still an amazing trip! The bad news is that 10 days in Italy are barely enough to scratch the surface of our beautiful Country. Yet the good news is that you can still make the most out of your trip, following a few suggestions and carefully choosing your route. A well structured 10 day Italy itinerary can definitely be a great introduction to gorgeous cities, mouth-watering dishes and historical sites. We know the feeling quite well. 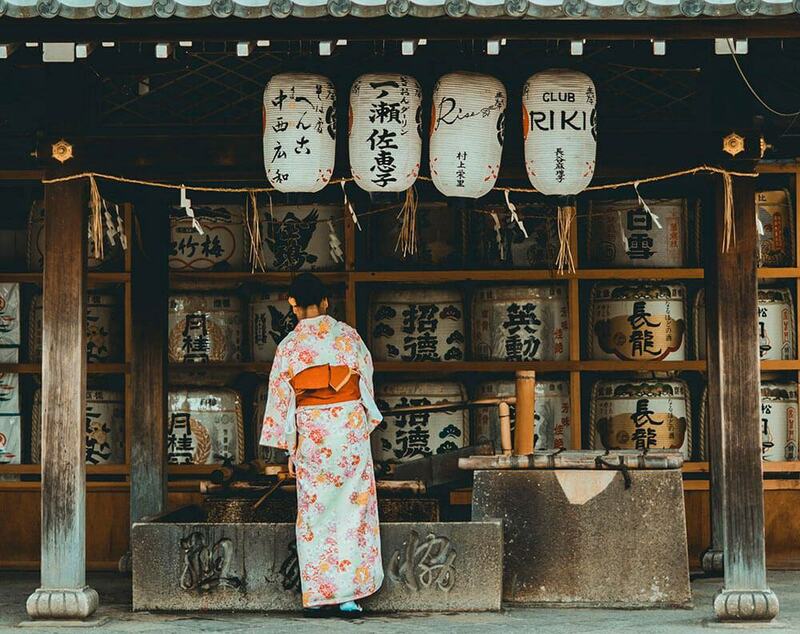 While planning our first trip to Japan we really wanted to see everything, but it was impossible. So allow us to offer a few insider tips and useful itineraries you can use for your first trip to Italy, making sure you’re not missing anything important! The Duomo terrace is absolutely amazing when it’s sunny and bright! The best way to see Italy in 10 days, exploring a tiny bit of everything, is by flying into Milan and flying out from Naples. This first itinerary revolves around quick visits to Milan, Venice and Burano, Bologna, Florence, Rome and Naples. The good thing about flying into Milan is that it’s easier to find amazing deals on its international airports – Malpensa, Linate and Bergamo. If you have only one day in Milan and you’re landing early, you can definitely explore this beautiful city. Try your best to sleep for a while during your flight! 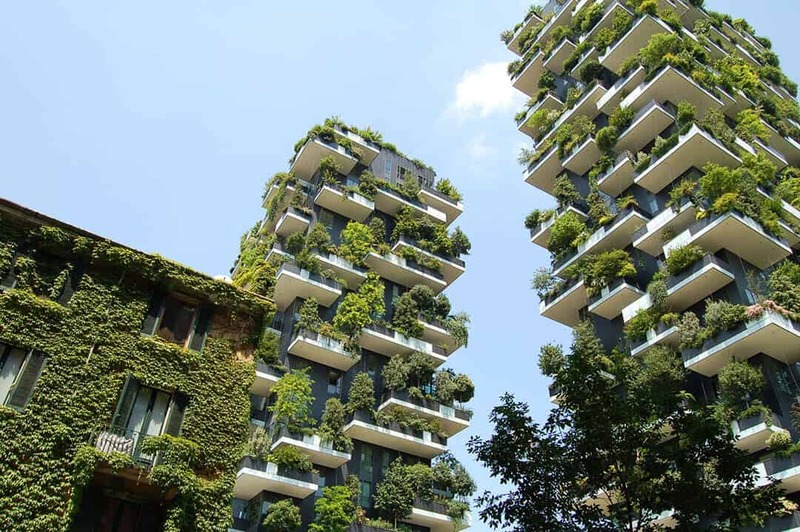 Milan is a mix of old and new, with its futuristic new districts and ancient buildings. According to how tired you are, you can explore Galleria Vittorio Emanuele II, which is a 19th century glass-covered arcade full of classy restaurants (here there’s a guide on tipping in Italy with some useful Italian sentences) and beautiful shops. At walking distance you will find the Duomo (Milan Cathedral) and Theatre La Scala. While the shops at Galleria Vittorio Emanuele II might be a bit too expensive, as you walk outside you will find many more affordable options: this is Aldo’s nightmare, because whenever we go there to visit my sister I spend way too much time shopping, especially during the sales period! Do you know what to wear in Italy? Read our guide to avoid the worst tourist mistakes! If you still have some time and would like to explore more, you could hop on a metro to visit Sforza Castle. This 15th century castle is located in the heart of Milan. This area is very colorful during the holidays because there’s one of the nicest Christmas markets in Europe! If you visit Italy in winter, Milan might be quite cold. Make sure you read my packing guide to winter trips so you won’t freeze! In case it’s getting late, head over to the Navigli. This district is named after the Naviglio Grande Canal, and it’s the place in Milan where you need to go if you want to eat some delicious Milanese cuisine. There are also many art studios and little galleries hidden down the side streets. Don’t go to bed too late, because the next morning you’ll need to catch an early train to Venice! 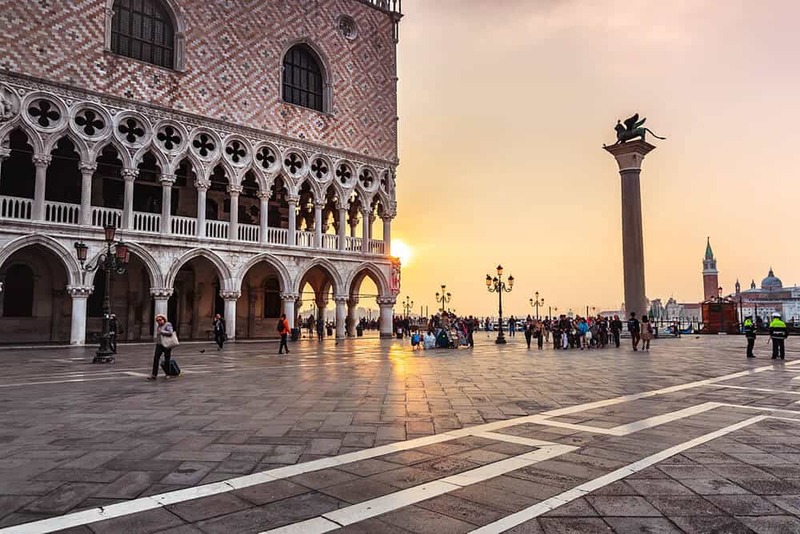 Sunset at Piazza San Marco in Venice: so romantic! Getting from Milan to Venice is easy. You just need to take a train (usually Trenitalia), and in 2h and 25 minutes you will get to Venice Station. If you get there early you’ll have a full day to visit all the main highlights in Venice. Just be aware that over tourism is a problem and it’s an expensive city. If you have a gondola ride on your bucket list, then definitely go ahead. Yet you can enjoy the city on your own all the same, even if you don’t do it! I confess I’m not a huge fan of gondola rides because they can be way too expensive for my tastes! Venice has always been one of the most romantic Italian getaways, but you need to be smart and try your best to avoid the huge crowds. Piazza San Marco is a must see, of course. Here you can visit the Basilica di San Marco, and climb the Campanile di San Marco (bell tower). Keep walking around: sometimes getting lost in a back alley in Venice can be a great thing! As you explore, take a few pictures of the Palazzo Ducale, an ornate gothic palace on the canals. There’s a museum and a show room: you can visit or not, according to your schedule! Yet no tour of Italy can be considered really awesome unless you visit the most instagrammable spot in Venice. Wasn’t it Piazza San Marco? Of course not! I’m talking of Libreria Acqua Alta! Located next to one of the most beautiful Churches in Venice, the Chiesa di Santa Maria Formosa, this place is like nothing else in the world. When there’s the high tide, water actually enters the shop, and that is why the books are stored in tiny boats, or even in an old bathtub! 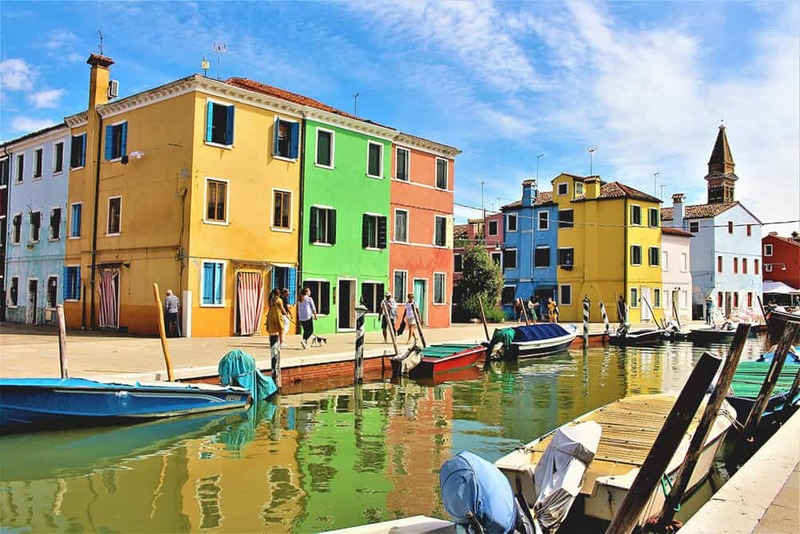 Your second day in Venice will be a day trip to the most colorful city in Italy: Burano! To get there you can either book a tour that will bring you there using a small boat (sometimes they also include Murano and Torcello, two nearby little towns), or get there on your own. To be honest the cheapest and easiest way to get to Burano from Venice is by booking a complete tour. Otherwise you can use the Alilaguna service, which is a private boat service that goes from Venice to Murano, and once you’re there, you will need to take a bus to Burano. In Burano, just walk around and enjoy this little, colorful town. It’s amazing! We really think it should be added to your 10 day Italy itinerary because once you’re there you won’t believe what you’re seeing! We love Burano so much! If your tour also goes to Murano, over there you can find the perfect Italian souvenir: Murrina. These jewels (now they are using this technique also to make bowls and other decorative objects) are made from glass and are as colored as the houses in Burano. Murrina is typically made only in Murano, but you will probably find it also in Venice and Burano. Make sure to buy plenty of souvenirs from Italy in the Laguna! Me and Al decided to add Bologna to our favorite itinerary because here you can really get a taste of Italy. This foodie paradise is where you can try delicious tortelli, tortellini, and every other kind of pasta with delicious fillings. In most of the restaurants, this kind of pasta is always fresh and made from scratch. But Bologna is also home to the delicious mortadella, prosciutto (ham) and many other cured meats! So definitely stop by not only to try some delicious Italian cooking, but also, if you want (and if you can! ), to buy some dry tortellini (the small ones) that you can bring home as a mouthwatering souvenir from Italy. Or even to try a cooking lesson! The easiest way to cook tortelli, tortellini or any other stuffed pasta is to add a stock cube to a pot of boiling water and then the tortellini. Cook them for a few minutes (read how long they should cook on the box), and then serve them with the broth and some grated parmesan on the top. Buon appetito! 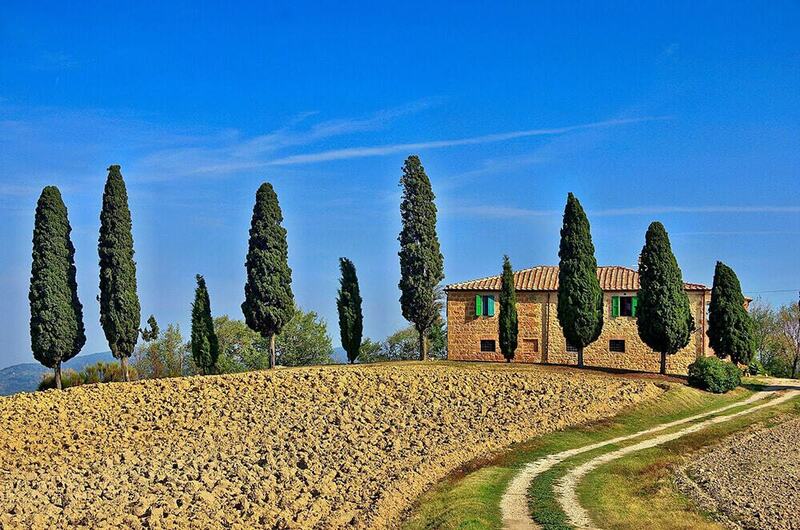 Visiting the Tuscany countryside is always an amazing experience! Two days in Florence can be good for the first timers. If you only have 10 days in Italy and want to see a bit of everything, you ought to sacrifice some in-depth visits. But think positive: when you’ll come back for your second trip to Italy, you’ll already know what you want to see! Here you can see all my favorite things to see and do in Florence. 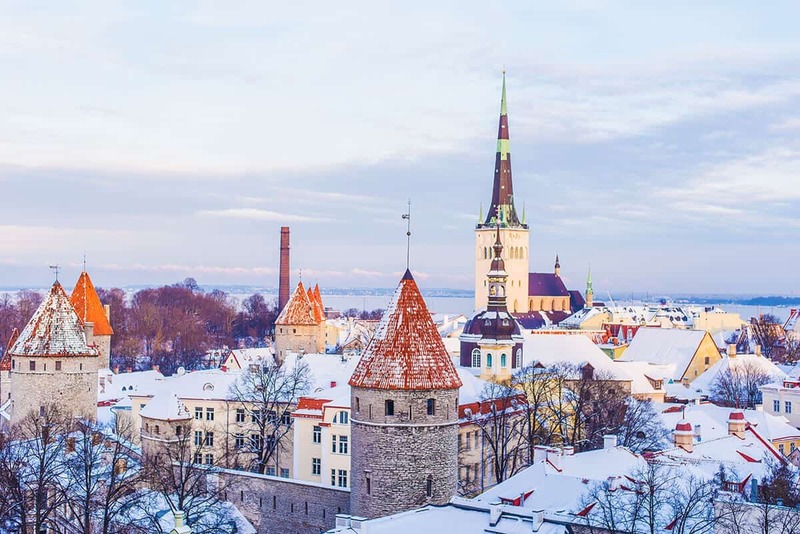 But definitely spend at least one full day exploring this amazing medieval city. You can get there from Bologna by train (Trenitalia or Italo): it will only take you about 35-40 minutes! So you have plenty of time to see the city. For great pictures you can go to Boboli Gardens, a 16th century garden that overlooks Florence. Boboli Gardens covers a large area on a hill, and is full of Italian sculptures, flowers and lots of trees. It might take you 1-2 hours to explore everything. 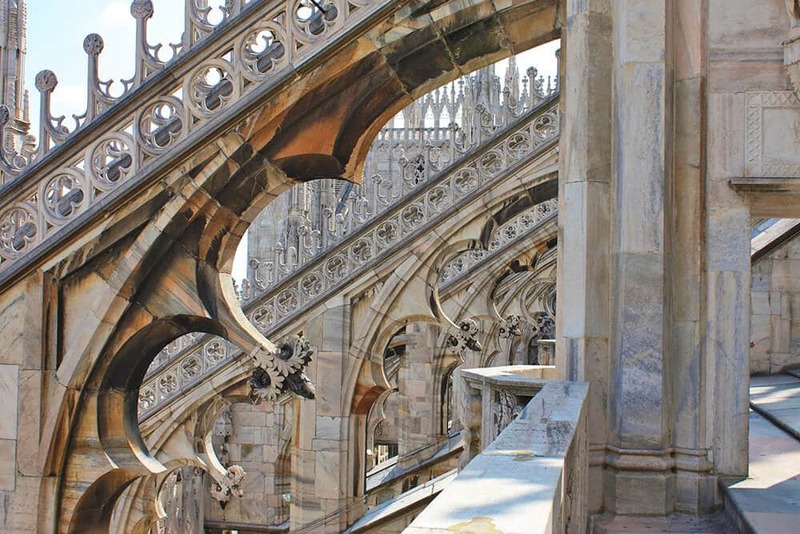 Once you’re done, you absolutely should go to the amazing Duomo. It’s the most important building in Florence, and it’s impossible to miss it! To visit it (as it happens with every other Church in Italy) you will have to cover your shoulders and legs, at least to your knees. Another instagrammable spot in Florence is Ponte Vecchio, which is also probably the most famous bridge. If you’re visiting on a warm summer day, enjoy the view eating Italian gelato. But… hey, nevermind. You should have gelato even if it rains, because who can say no to Italian gelato? Heck, I’m Italian and I should know: I can’t resist! If you are visiting on a rainy day, some of the best museums you can visit are Galleria dell’Accademia, to see Michelangelo’s greatest works, Palazzo Pitti, which is Florence’s biggest art museum, and a must see on every Florence itinerary… or the Galleria degli Uffizi. If you plan to see the Uffizi Gallery, by all means, take into account that you will need a half day just for that one. I promise it will take your breath away so please don’t be discouraged by the long lines! You can buy an extra ticket to avoid them, if you are in a hurry. Unfortunately Uffizi is the most famous museum in Florence and one of the best in Italy so whenever you go there will always be a long line at the entrance. The visit is also pretty long so unless you want to spend the whole day going from one museum to the other, you can eventually consider visiting Uffizi and avoiding the other two. Your second day in Florence should be dedicated to one of the little towns in the area. Some are absolutely beautiful and you can get there easily using the train (tickets are also pretty cheap). From Siena to Pienza, to the beautiful Lucca (especially if you visit when there’s the Lucca Comics and Games! ), there’s so much to explore! You can also reach Pisa to see the Leaning tower, or Volterra if you’re a fan of vampires! This quaint little town was in fact the setting for New Moon, the second vampire book in the Twilight series. The Colosseum is a must see in Rome! To get from Florence to Rome you have three options, according to your time and budget. You can either choose a fast train (Italo or Trenitalia), which takes about 1:32 hours and might be a bit more expensive. Or a regional train (Trenitalia), an option that usually takes between 3 and 4 hours, and is a bit less expensive (and less comfortable). Or the cheapest way: Flixbus. While using a bus is way less expensive than buying fast train tickets to go through your Italy trip itinerary, you always have to remember that it will take longer. Sure, you’re saving on your budget but spending the most precious value: time. You don’t have much of that, so I’d try to splurge a bit on trains to get the most out of this tour of Italy. Rome in particular can be a bit messy: traffic jams are frequent and unfortunately buses don’t always show up. Even Aldo doesn’t like to drive in Rome so we usually get an Italo train from Naples to Rome and explore using the metro, to avoid the traffic! Only two days in Rome won’t be enough to see everything, but you can definitely fit in the Colosseum, the Pantheon and the Galleria Borghese. One of the most iconic and instagrammable places in Rome is the Trevi fountain: you absolutely need to get there very early in the morning (sometimes 7:00 am can be already late!) to get a picture without all the crowds hounding you! I am sure there’s no need to say it but jumping in the Trevi fountain is never a good idea. You will get fined and removed by the police. Unfortunately lately there have been a few cases of people who wanted to recreate La Dolce Vita scene in the Trevi fountain. Like Anita Ekberg they prance around in the water, blowing kisses to the tourists and calling “Michele“. Aside from the fact that it’s against the law, it’s also very much disrespectful. Rome’s citizens are rightfully fed up with the shameful treatment that their city’s monuments get from visitors. Don’t be that kind of tourist! In the evening, unless you’re too tired, you could try to have a good pasta cacio e pepe in the Trastevere area. Your 10 day Italy itinerary is coming to an end, but there’s still time to visit yet another State… Vatican city! It is the smallest Country in the world, and while you can spend one full day just exploring and taking pictures of the majestic monuments and buildings, I also encourage you to visit some of them. St. Peter’s Basilica sits atop a Roman necropolis. Whenever we visit, me and Al always feel so tiny: it’s one of the most beautiful buildings in the world, if you ask us! Visiting the whole Basilica will take you about 1 hour. When you’re done, get ready for a sight that will spoil you for life. The frescoes at the Sistine Chapel are stunning. Bright, colorful, absolutely beautiful. You will spend quite a while with your nose up in the air! Unfortunately, unless you really give up on something, there might not be time to visit the Musei Vaticani (Pope’s Museums). The line is always pretty long and it takes quite a while to see everything. Instead you could go to Piazza Navona , which is filled with cafes, shops and restaurants. Or to Piazza di Spagna, where you’ll find the famous stairs! We feel very lucky to live so close to the Amalfi Coast! To go from Rome to Naples you have the same options I already told you for the previous transfer from Florence to Rome. Fast trains are a bit more expensive but definitely the less time-consuming option. Italo or Trenitalia should take one hour or one hour and half. Treno regionale (usually Trenitalia) will get you to Napoli centrale from Rome in less than 3 hours. As for the bus… well, the truth is that both Rome and Napoli are high-traffic areas so who knows? It could be 2 hours or way more than that! Exploring the main highlights in Naples in one day is definitely doable, especially if you head over to the area around Via Medina. It’s packed with interesting buildings, castles and delicious eateries. In this area you can see Palazzo San Giacomo, the castle Maschio Angioino, San Carlo Theatre, Galleria Umberto I, Piazza del Plebiscito, Via Toledo, Castel dell’Ovo and so much more! My article on the best places to stay in Naples could come in handy also when you have just a couple of days in my city. Well, in this case, if you’re staying around Santa Lucia, you can definitely walk your way through this first day itinerary. If you’re lodging in the Centro Storico (the old part of Naples, where Christmas Alley is located), get the metro to Via Toledo. It’s one of the art metro stations in Naples and considered the most beautiful metro station in Europe! Since there are so many things to see and do in Naples, you have many options for your second day. Either visit a few museums, Naples Christmas Alley and a few ancient Churches, or Naples Underground. Then again, if you feel like trying a longer trip (it really depends on your flight back, don’t overdo it! ), you can have a self guided tour of Pompeii or maybe hike on Mt. Vesuvius! Did you know that in Venice people use water taxis? Another interesting variation on our 10 day Italy itinerary avoids Bologna (the foodie stop) to spend one more day in Rome. Having one more day in Rome means that you can enjoy the Musei Vaticani! Or, if you feel like having a day trip, you can take the train to Bomarzo Monster Park (make sure the weather is good! ), also known as the Sacred Grove. It’s one of the hidden gems that you can add to your Italy itinerary also if you don’t have much time. After all, as I already told you, it’s all a matter of planning wisely what you want to see! Another interesting day trip from Rome can be the Tuscia Viterbese, rich in history and great food. Here you can find our itinerary for Rome in 4 days that can be very helpful to start planning your trip in detail. If you are spending your 10 days in Italy with the kids, another day in Rome means that you can bring them to a very cool theme park, Rainbow MagicLand or to Cinecittà World. The second one is also very nice for the grown ups because it’s a theme park completely dedicated to movies, especially those filmed in Cinecittà (Rome). There’s Ben-Hur, Jurassic Park, movie-themed rides and a whole area dedicated to spaghetti western, specifically to the Sergio Leone ones. 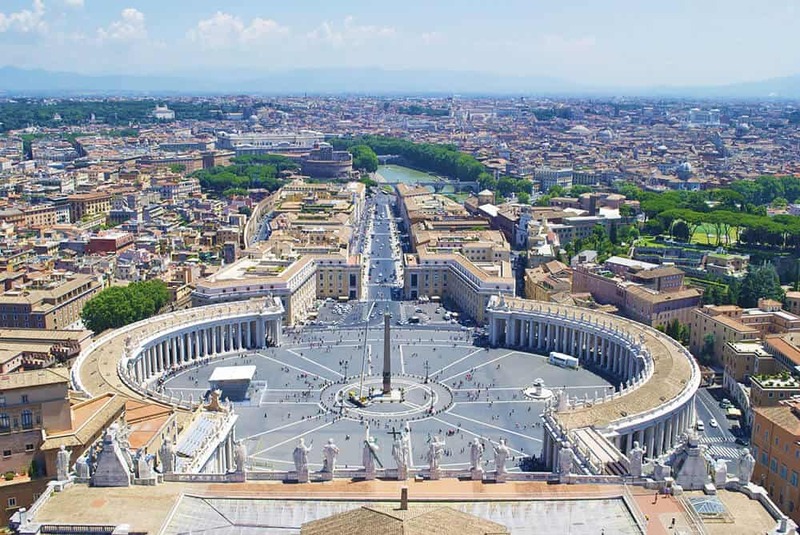 Vatican City is the smallest Country in the world! A third route for your 10 days in Italy starts and ends in Rome. When there isn’t much time I always avoid round trips because you need to get back to the starting point. But round trip tickets are usually less expensive. Which means that you can splurge a bit more during your 10 day trip to Italy. 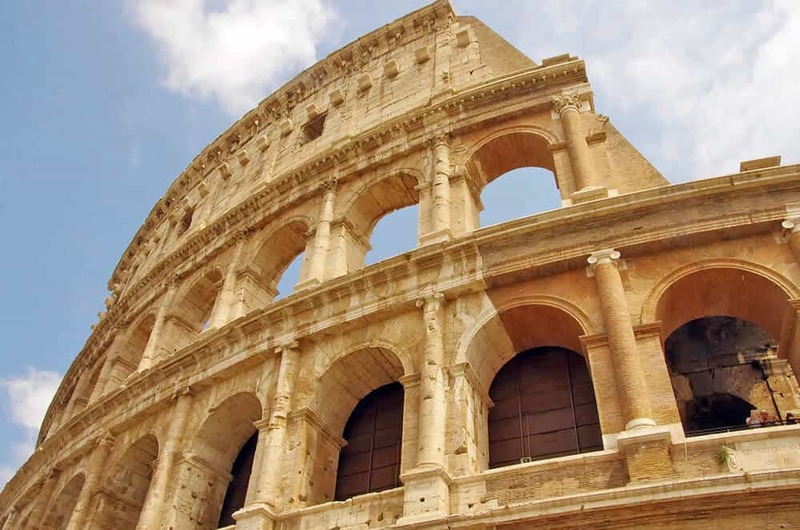 And with this specific itinerary, we’ll use a fast train to get back to Rome in no time! With this itinerary we will focus on Rome, Vatican City, Sorrento, Pompeii, Capri, the Amalfi Coast, Florence and a bit of Tuscany. You can follow the itinerary for Rome from the previous route! I’ve read in some blogs that they encourage people to take the train from Rome, bring your luggage with them, go straight to visit Pompeii (still dragging their luggage!) and then to the Amalfi Coast. Please, don’t do that, it’s insane! While it’s true that you don’t have much time, this will only ruin your trip. I have been a number of times to Pompeii and I can tell you for sure that you absolutely can’t visit the archaeological site while dragging a heavy suitcase. Heck, even a heavy backpack would be too much, because you will need to walk a lot on an uneven terrain! There’s a luggage storage facility on the lower level of the train station. But you know I always tell you the good and the ugly truth about Naples: I live in the area and I wouldn’t leave my own luggage at the Circumvesuviana station. Let’s keep it at that. I suggest you arrive in Naples, and find lodging near a metro station. Leave your luggage to the hotel and just take the Circumvesuviana train to Pompeii. Tickets are cheap, and the train ride will only last about 30 minutes. From the Pompei Scavi station you just have to walk for 5 minutes to get to the entrance of Pompeii. According to how tired you are and how much time you have left, you will have to decide if you want to try the 2 hours or 4 hours self guided itinerary. There’s also the chance to book a guided tour with an archaeologist. Another variation could be to go from Rome to Sorrento and from Sorrento to Pompeii. The problem isn’t really the distance from Sorrento and Pompeii, as that is the same as Naples, (30 minutes using the Circumvesuviana). Yet you will have to change trains in Naples anyway, as there’s no good option that goes straight from Rome to Sorrento. From Naples you will need to take another Circumvesuviana train to Sorrento (unless you decided to spend 3 days in Sorrento). Getting from Naples to Sorrento takes 1 hour. A Unico Campania U5 ticket costs 4,10€. Once you’re in Sorrento, leave your luggage at your hotel and take a bus to the Amalfi Coast. The main route will stop at all the villages so you will have time to visit Positano, Amalfi, Minori (eat some delicious Neapolitan cakes!) 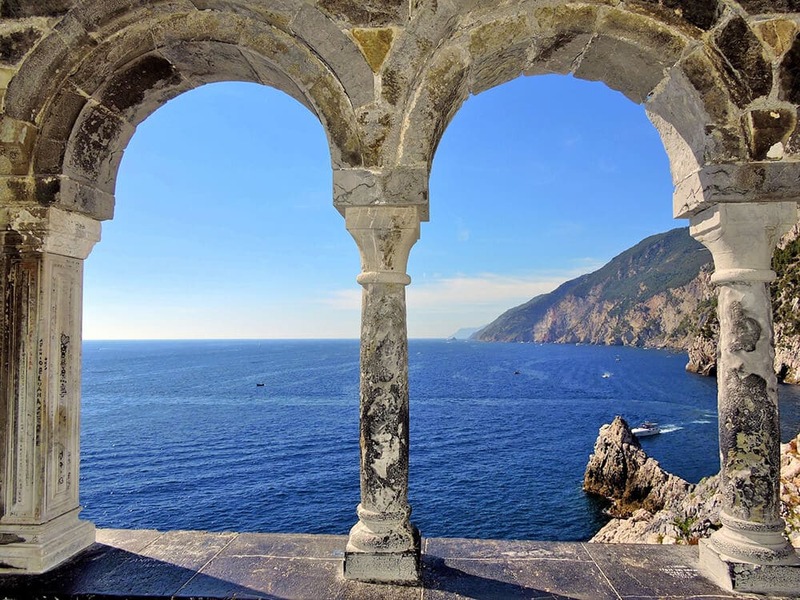 and maybe even Ravello. Unless it’s too late, you might be able to explore at least some of the best beaches on the Amalfi Coast even by using public transport. In the evening, get back to Sorrento, where you can have dinner eating some fresh fish or spaghetti con le vongole (spaghetti with clams). Deciding where to stay on the Amalfi Coast is very important, considering you don’t have much time! The following morning take an early ferry for a day trip to Capri from Sorrento. Explore the island and have fun at the Blue Grotto, Anacapri and maybe visit the Giardini di Augusto (Gardens of Augustus)! Make sure not to miss the last ferry back to Sorrento! On day 7 of your 10 days in Italy, get up early to catch a Circumvesuviana back to Naples. From Napoli Centrale station take a fast train to Firenze Santa Maria Novella (Italo or Trenitalia – we usually prefer Italo). The train ride will take 3 hours and can be a bit expensive. But there’s a way to save quite a lot of money… book it in advance! You can do that from the Italo official website, or as soon as you land in Italy, at a big train station that has an Italo office (for this trip: Florence, Rome, Naples). The sooner you book, the better (tickets are non refundable). If you feel like trying a short Tuscany itinerary off the beaten path, I’d suggest going to Palazzuolo sul Senio on your second day in Florence. 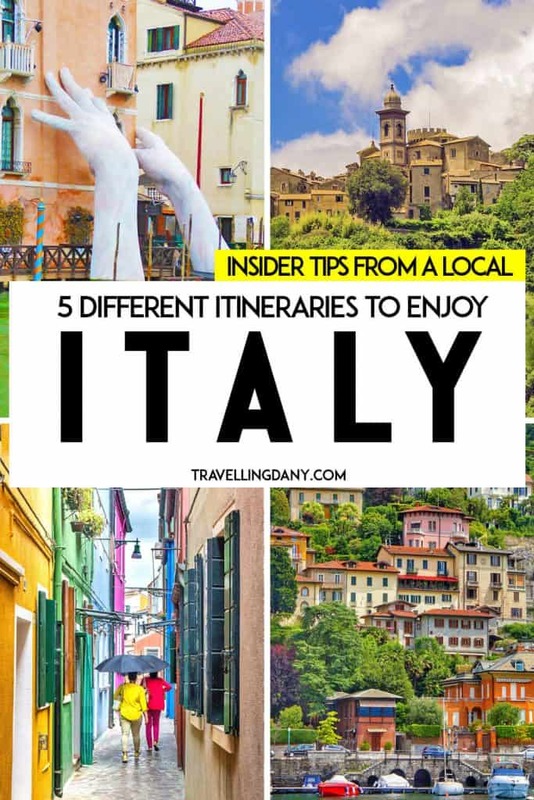 It is a tiny town between Tuscany and Emilia Romagna where food is delicious, you can hike in a beautiful forest and you can even do some horseback riding! So you could spend the first night in Florence, the second in Palazzuolo sul Senio (make sure to book in advance as the town is tiny and you might not find a place to stay! ), and the third again in Florence. 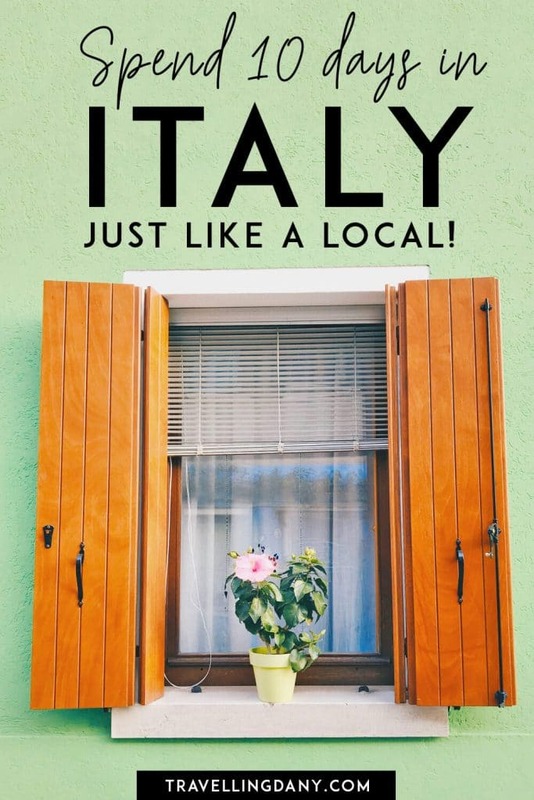 Yet of course this is a 10 day Italy itinerary so you can definitely get back for more on your next trip to Italy! If you want to stay 3 days in Florence, you can explore the city in one day and then visit the hill towns in Tuscany on the other two. From Firenze Santa Maria Novella take another fast train to Rome. The trip will last 1:20 hours more or less. From Roma Termini you will need to take another train, the Leonardo express, to get to the Fiumicino airport in about 32 minutes. 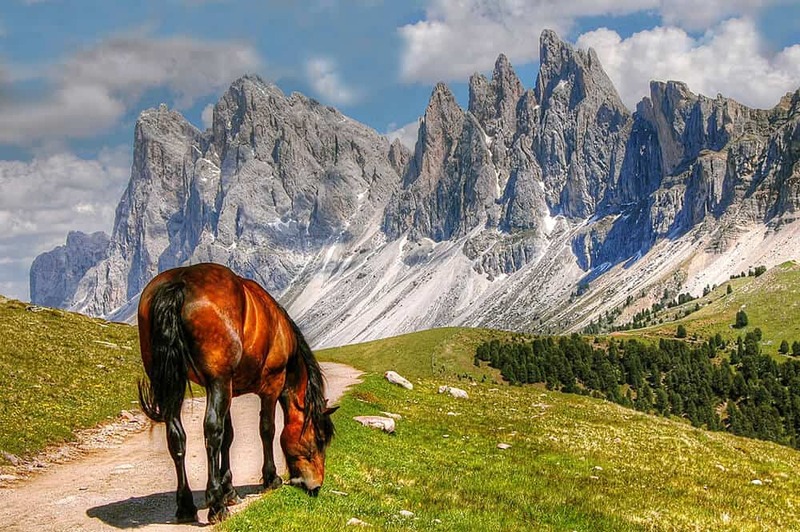 So many people don’t even consider the Dolomites when visiting Italy, yet they are amazing! This is an Italy road trip itinerary in the Northern regions. You will need to rent a car that you can pick at the airport upon arrival in Venice. The car will have to be left at one of the parkings in the Dorsoduro area, right after crossing the Ponte della libertà (Liberty bridge). 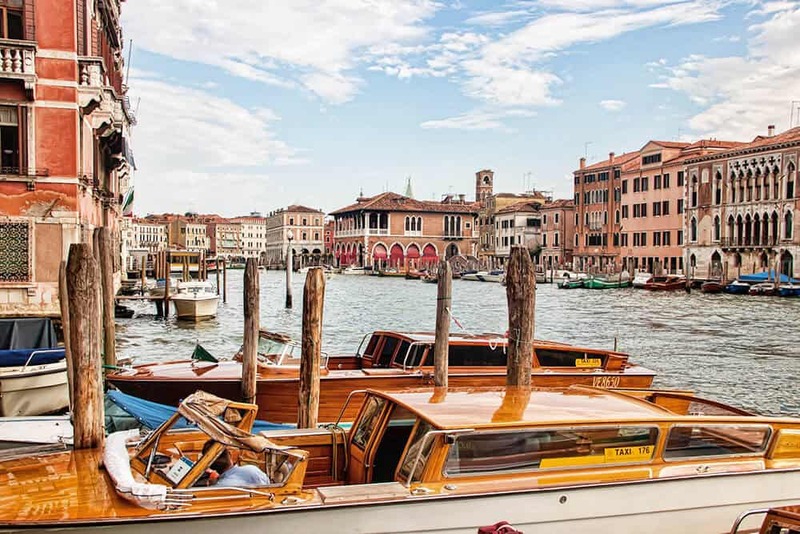 This self drive Italy itinerary will bring you to Venice, Dolomites, Verona, San Marino and Tuscany. Upon arrival, pick up your car and find your hotel. According to when you’re landing in Italy and how tired you are, decide if you want to walk around the main landmarks like Piazza San Marco or the Rialto Bridge, and then have a nice Italian dinner. Benvenuto in Italia (“Welcome to Italy” in Italian)! On the following day you will have enough time to explore this amazing city. And splurge on a gondola ride, if it’s high on your bucket list! I don’t really think there would be enough time to go to Burano. If it’s mandatory and you prefer Burano to Venice, then I suggest you find a boat tour to Burano early in the morning. Eventually you can see a bit of Venice when you get back in the evening. 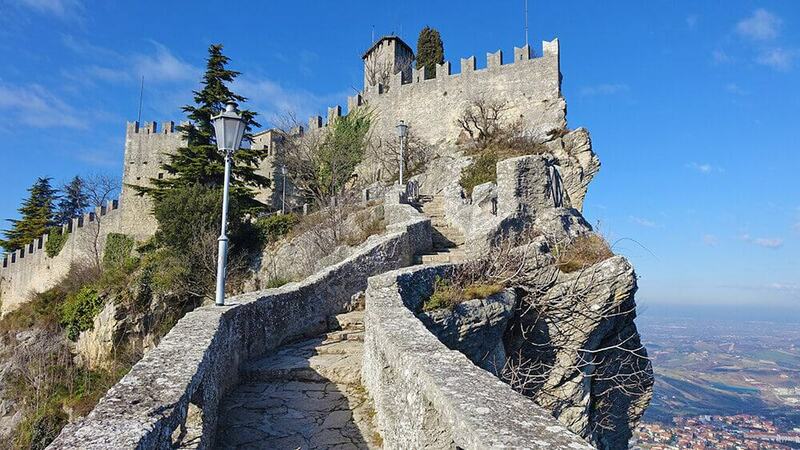 Climbing up to San Marino Castle can be… quite challenging! The Dolomites aren’t usually taken into account when people visit my Country. Especially when they have to plan only a 10 day Italy itinerary. Yet while this area is best explored using a car, it will reward you with delicious local dishes and amazing views. This is also a hiking paradise. If you have time and enough space in your luggage for a good pair of hiking boots, I suggest you give it a try. Otherwise you can definitely explore on horseback. The ranches in the area are usually full of beautiful horses and trainers ready to show you what to do, even if you’re not an experienced rider. It is worth it, if only for the spectacular views! The most popular towns where you can find lodging are Bolzano and Cortina d’Ampezzo. These are especially crowded (and expensive) in winter, because the Dolomites turn into a skiing paradise (how could I not add it to a Northern Italy itinerary?). Yet this area is also very beautiful in summer time, as it’s never overly warm. It will take you about 2 hours and half to drive from Venice to Bolzano or Cortina d’Ampezzo. Once there, enjoy a good polenta! It’s a dish of boiled cornmeal, usually served as a hot porridge. “Side” dishes to go with polenta can be mushrooms, cheese, chicken, rabbit meat or even fish! After a large Italian breakfast (hopefully with a good cup of Italian espresso), you will drive to Verona. From Bolzano it will be a 2 hour drive, and a 3 hours and half drive from Cortina d’Ampezzo. 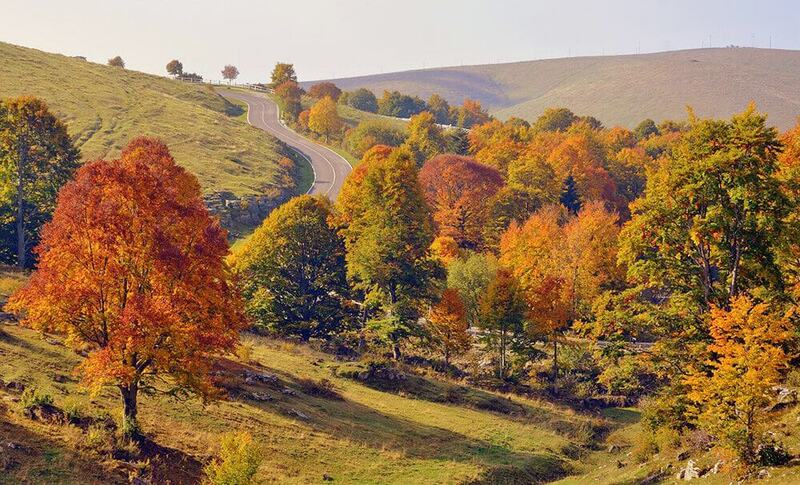 Enjoy the view, as this is one of the most gorgeous areas in Italy when it comes to road trips! Verona is the city of love, even more than Venice, and it’s one of the most romantic Italian getaways. The city of Romeo and Juliet is visited every year by millions of people in love who want to see the “Casa di Giulietta” (Juliet’s house) in via Cappello 23. There’s the famous balcony and even a bronze statue representing Juliet. According to a local legend, if you put your hand on the statue’s heart, you will be granted eternal love. And, just in case you’re thinking of eloping to Italy, you can get married at Casa di Giulietta! Verona can be explored even just walking around: make sure to also visit the nearby Casa di Romeo! Our trip to Italy off the beaten path will continue in San Marino. From Verona the drive is pretty easy as it will be mostly highway (with toll). San Marino is the third smallest country in Europe (after Vatican City and Monaco). It’s also the oldest republic in the world, founded in 301. 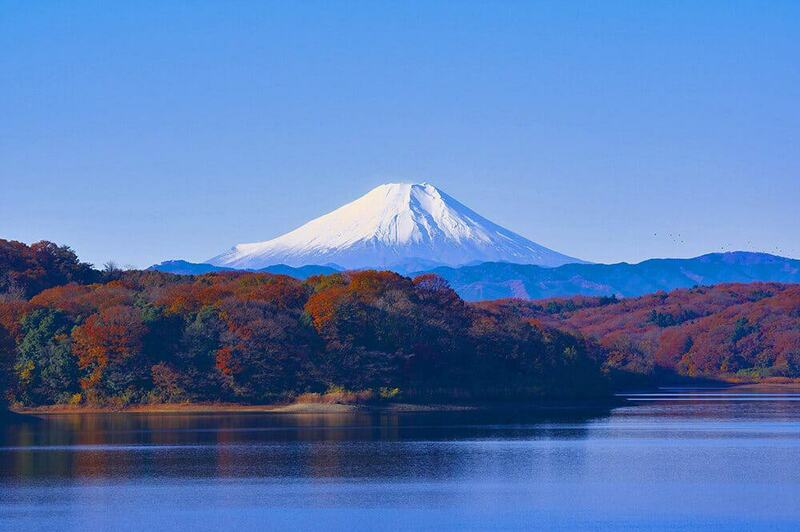 It has become part of the UNESCO World Heritage List in 2008. While San Marino is not a member of the European Union, the border with Italy is open. You can just park your car and explore the city walking around. Because San Marino City is divided into what could be considered as 12 levels, there’s a “funivia” (cable car) that connects Piazza della Libertà, on level 2, to Piazzale Campo della Fiera in Borgo Maggiore, on level 12. The walled city is full of interesting shops. Lots of artisans sell armory and make swords. Because I love them, I have bought a couple there, a Japanese-like katana and a medieval short sword. Then my mom visited and bought me also an amazing fantasy dagger, handmade in San Marino! In case you’re going to buy a dagger, a short sword or any other sharp object, you will need to put it in your checked luggage, and declare it at the airport. The food in San Marino is mostly Italian, they cook many dishes from Emilia Romagna cuisine, so you will find many piadina (thin flatbread filled with different ingredients) kiosks. Piadina is cheap and delicious, so you can eat on a budget! Renting a car in Italy means that you can enjoy an amazing road trip! Speaking of good food, on your 7th day of your Northern Italy itinerary you will stop in Bologna! 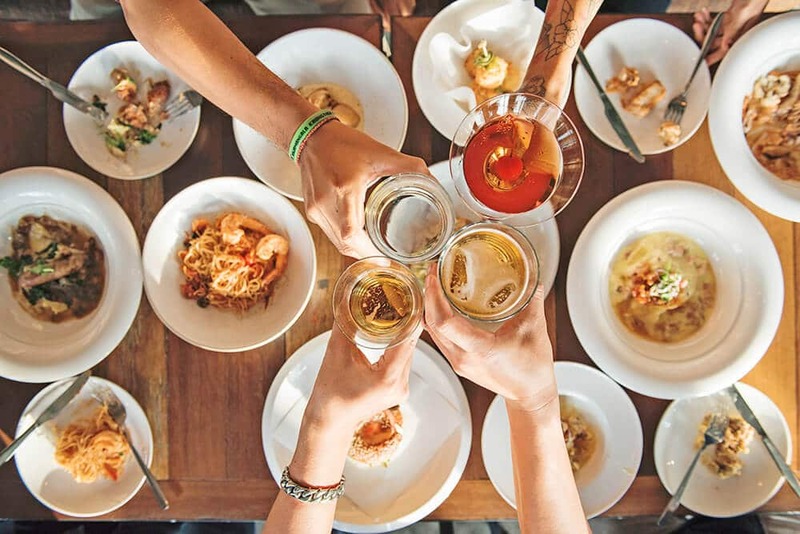 This is a real foodie destination, and while the city is very interesting, especially if you like history, I suggest you plan something interesting like a cooking lesson or a foodie tour. Learning how to make tortelli or ravioli is a great experience: you will be able to cook delicious Italian dishes once you’re back home! Driving to Bologna from San Marino will only take you a bit more than one hour and half (hopefully there won’t be too much traffic), and it’s mostly on a toll highway. After a relaxing day in Bologna, completely dedicated to good Italian food, head to Florence. The drive will be again on a toll highway and it will take you less than 2 hours. My suggestion is to book a room in Florence and use it as a base to explore a bit of the Tuscany countryside. Sure you’ve spent almost 10 days in Italy, but the best part of it is yet to come! There are so many beautiful little towns in Tuscany that you can visit only if you’re renting a car. 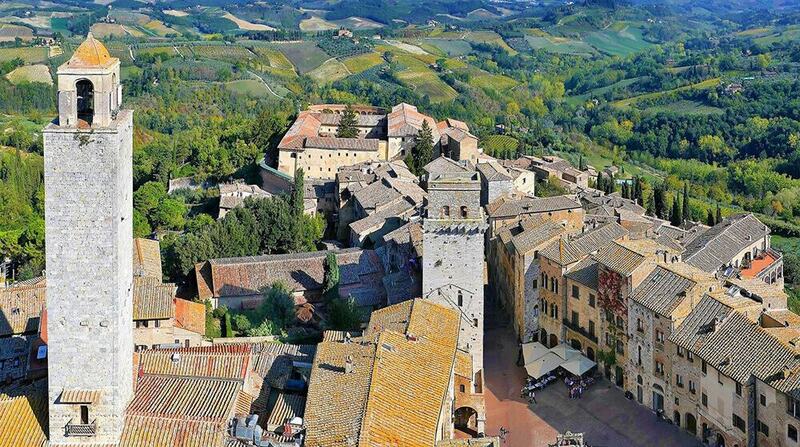 I’m thinking of places like Montepulciano, San Gimignano, Pienza, Palazzuolo sul Senio. 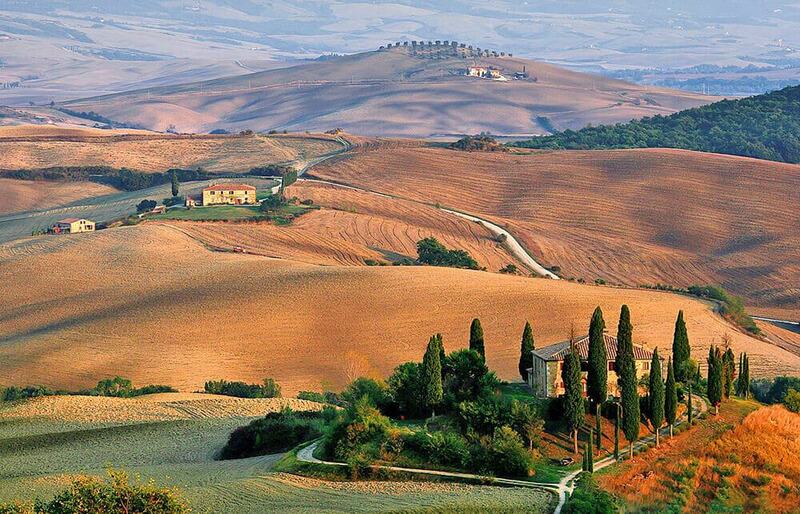 Food is delicious, the welcome will always be warm and believe me… the Tuscany countryside is just so very beautiful! It’s definitely worth the trip! On your last day in Italy, you can drive to Rome, as there’s a bigger airport (which usually means finding better deals), and leave from there. This Southern Italy itinerary off the beaten path is amazing! The South is usually very much neglected, and yet it has so much to offer! Some of you might think that it’s not a good first timers Italy itinerary, because you don’t get to visit Venice, Rome or Florence. But I give you my word that you won’t complain once you’re there! The South, especially off the beaten path, is the truest Italy you can find. For this itinerary you will need a car, and it’ll be a round trip from Naples. This 10 day Italy itinerary will drive you through Naples, Amalfi Coast, Capri, Castellabate, Matera, Salento and Gargano National park. Because you will explore many amazing beaches, I think the best time to plan this trip to Italy is Spring or a very early Summer. Remember that these areas are loved by the Italians and thus June, July and August will be expensive and overcrowded: avoid these months at all costs! You will land in Naples Capodichino airport, where you will take your rental car. According to when you’re arriving and how jetlagged you will be, there might be enough time to start exploring. Yet pizza for dinner is mandatory! On your second day, I suggest you plan an early road trip to the Amalfi Coast. You can explore all the nice coastal towns avoiding the huge traffic and stopping wherever you want. Remember that to explore Positano you will have to park your car at the city entrance. There are two private parkings on the road, leave the car there and explore by foot. In case you’re planning to tan for a while, considering you only have a day trip to the Amalfi Coast, you might consider spots like Minori and Maiori. They’re slightly less crowded by the tourists, there are more parking spots (not many!) and you just have to walk to the beach without climbing lots of stairs. Your third day can either be a day trip to Capri from Naples, or a longer visit to the Pompeii archaeological site. See if you want to make this tour of Italy all about beaches and good food, or if you want to fit in also a bit of history! Get up early on your last day in Naples to explore a place… that will blow your mind. Not many people from abroad know about Castellabate. This little gem is at less than 2 hours from Naples (you absolutely need to drive there) and it’s been known to be the most beautiful little town in Italy. Celebrated by a lot of movies, it’s in the Cilento area. Drive there, then park your car and just walk around. You can just explore, or hike, or just jump into its turquoise waters. There’s even a diving center! The beauty of the coast will take your breath away. Have lunch at one of the tiny restaurants: the traditional dish here is fusilli al sugo di castrato. It’s fusilli pasta, still handmade with ancient techniques, with a tomato sauce and ground meat. Try it at the Ristorante Vineria Divino, located in the main square. They also have lots of delicious local wines! You can (and should) sleep in one of the trulli in Alberobello! The drive from Naples to Matera will take you about 3 hours. It’s mostly done on toll highway. Matera is a UNESCO World Heritage Site, European Capital of Culture 2019, and it’s famous for its “sassi“. 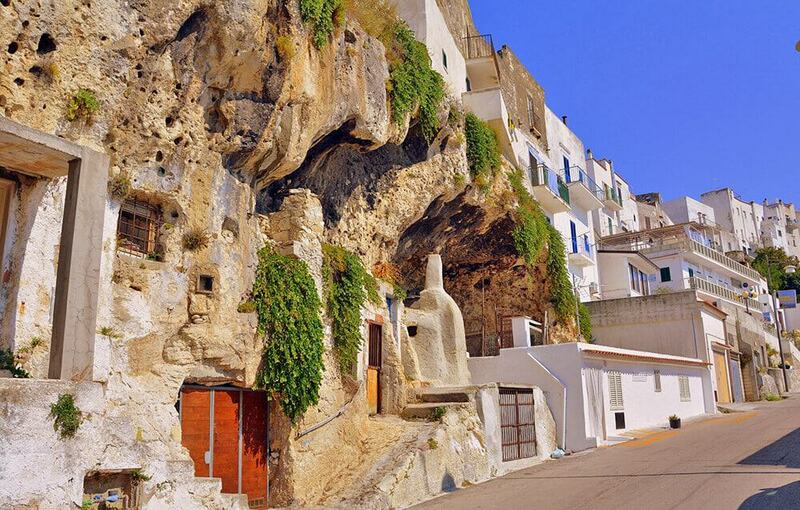 Sassi are cave houses that have been inhabited by the local farmers until the 1950s. I suggest you take a guided tour of the sassi and visit the historic reconstructions of life in the caves. Here Mel Gibson filmed his movie “The Passion of the Christ“. The drive from Matera to Alberobello only takes a little more than 1 hour. It’s mostly on a toll highway but the last part of it, on a State road, might be a bit of a pain because of the traffic jams. Try to leave Matera early in the morning, so you will have the whole day to explore the amazing Alberobello! This little town in Puglia region is known for the “Trulli“, tiny houses dating back to the 14th century. They are shaped as a cone on the top and are different from everything else in the world. 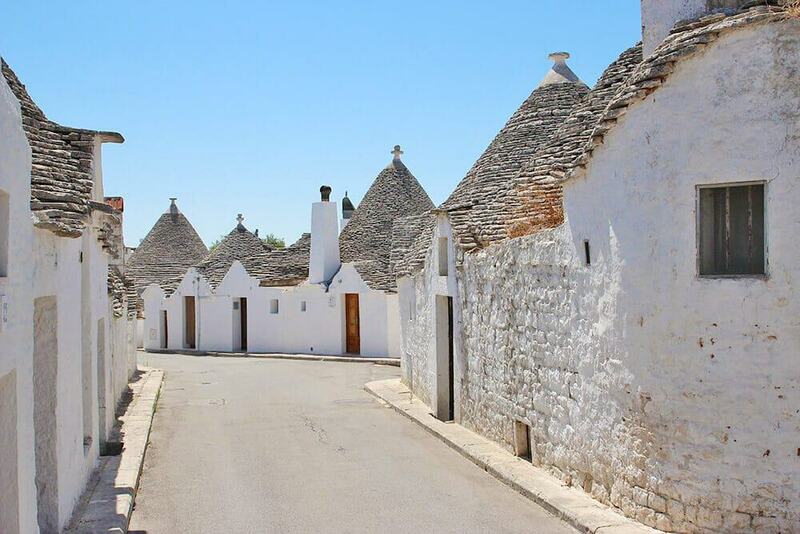 You will be staying in a trullo for two nights wile exploring the area. I suggest La Chiusa di Chietri, or Il Palmento, in Locorotondo, a nearby town. On your second day in Puglia this tour of Italy will have you exploring the Salento area. Famous for its beaches and good food, it’s been recently discovered also by the Hollywood celebrities, but Italians have always loved it! Together with Sicilia and Calabria it’s one of the best regions when it comes to amazing beaches. We explored Salento’s best beaches and loved every minute of it: they say it’s the Italian Caribbean! To avoid the usual traffic jam I suggest you leave Alberobello early in the morning. The drive to Manfredonia, your base for the next two days, should take you a bit more than 2 hours. From Manfredonia it’s easy to reach the Gargano National Park. While it’s not very well known to tourists from abroad, in Italy it’s very famous as a place for our summer vacations. This protected area is full of beautiful forests where you can hike, amazing hidden beaches, turquoise waters and delicious food. The drive back to Naples will take over two hours and half, so you’re bound to leave early to avoid all the traffic. According to when you have to fly back home, enjoy the city and… eat some more pizza, of course! 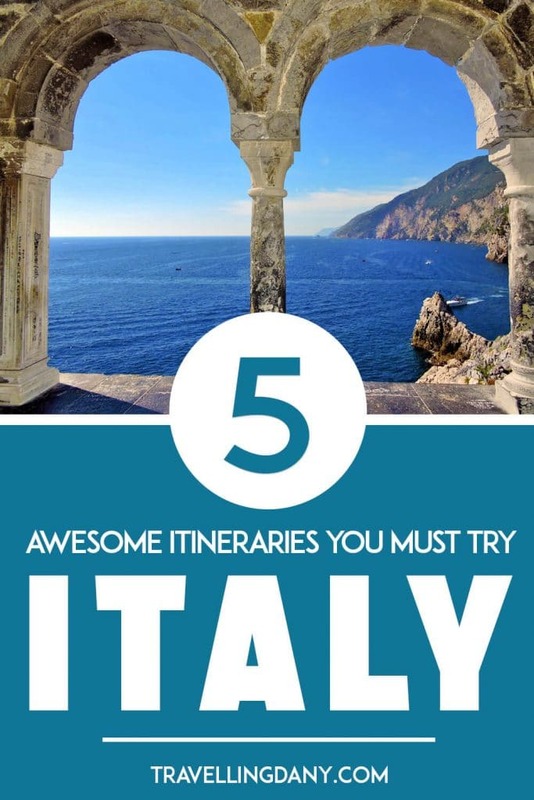 I hope these 5 routes to enjoy 10 days in Italy will be useful for your next trip! Whether this is your first time visiting Italy or if you are a seasoned traveler, these 5 routes will show you all the best parts of my Country. Let me know in the comments if you are planning a trip to Italy or if you already visited! Buon viaggio (have a good trip in Italian)! This is so great! Pinning it for when I plan my next trip to Italy! Fingers crossed that you get to visit Italy soon then! Danila, this is an eye-popping guide on Italy. Well done buddy. Thank you so much Ryan! It took me a while to put it together but I wanted it to be really useful. I’m so glad you like it!